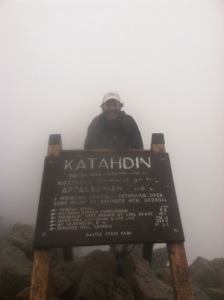 Three weeks ago, on a wet, cold, potentially hypothermic day, I summited Katahdin. Almost regretfully, it feels strange to allude to the hike in the past tense. For so long I thought about how many days had passed from the beginning of the hike. Now I find myself contemplating the number of days since it ended. This, the third week since its conclusion, coincides with the six month anniversary of its beginning. I deemed time irrelevant while following white blazes. In the present, time again marches on. Moments exist when I feel as if the hike didn’t actually occur, but instead resides merely in my imagination. 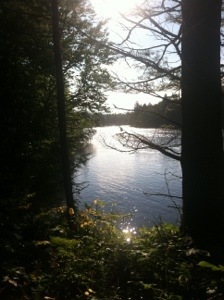 The reality of the regular world has for now replaced the gossamer existence on the trail. The adjustment back to my “real life” has proven challenging at times. At others it seems almost as if I had never been away from my home. When I walked into my church sanctuary the first Sunday after returning home, I felt as if I had attended the previous week. I sat on the same pew. The same parishioners surrounded me. Then when the pastor welcomed me back, for a second I wondered where I had been. Many wanted to hug my neck or shake my hand. I smiled, thanking each for his or her prayers while I was away. When the service ended I attempted to make a quick exit, not really wanting to talk about the hike. As it simmered in my subconscious I desired to keep it to myself, only reluctantly sharing tidbits with those who asked. I had openly written about each day while on the trail; now I wanted instead to protect the memories. Verbalizing my feelings seemed more difficult than typing them. After all, who would really understand? I have met with some of my friends. I shared a lunch with some of my running buddies, answering a variety of AT questions, but more importantly fellowshipping with good friends that I had missed. I’ve exchanged emails or text messages with Banzai, Molar Man, Pilgrim, Susquehanna Slim, and Steady and Spirit. I miss my AT pals. I also miss the trail. While hiking I just wanted to finish. 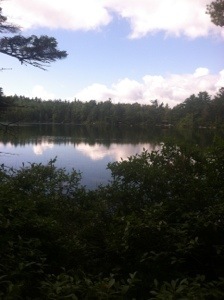 Now I find myself contemplating being back in Virginia or Vermont or New Hampshire. Just like in this paragraph, my mind fluctuates constantly. I pick up my cell phone to make a call to only find myself scrolling through trail photos. I wonder how others who shared their hikes with me are adjusting to the “regular world.” I debate whether or not to make a phone call. I replay in my mind the good times, the times of excitement and joy. But just as often, I recall days of duress and fatigue. Equally, I bask in the memories of both. I’ve gone to the beach and thought about the mountains while walking barefoot in the sand at dusk. I viewed the setting sun over the waves and remembered a twilight in Pennsylvania. I ate seafood on a weathered, wooden deck and recalled a restaurant in Maine. I strolled down tree-lined streets at sea level with a vision of roots and rocks transfixed on my brain. I spoke often of the hike. Linda patiently listened, reminding me that we could go to the mountains in October. I wondered if a brief visit to the Smokies would satisfy a longing for white blazes. Sometimes I think of Ulysses when he returned home to Ithaca. Tennyson was right. How does one truly “adjust” after a great adventure? As my hike neared its end, I kept repeating, “each step I take is a step I’ll never have to take again.” I suppose the key words there are “have to.” No, I’m not contemplating another thru hike. I’m not even planning a return to the trail anytime soon. I’m not ruling out, however, other hikes on the AT or even other trails. They just won’t occur in the immediate future. For now, I’m happy in this “regular life” in the “regular world.” Still I will daily cherish the many fond memories that have forever become a part of me because I chose to go for a hike on the Appalachian Trail. Monday, September 2….When Molar Man said he would like to stick with our plans to summit Katahdin on Labor Day, regardless of the weather, I felt just a bit concerned with our decision. With a 90% chance of rain by early afternoon, I seriously wondered if we were doing the smart thing. I had been somewhat apprehensive and a little anxious about the climb for the past week. Due to the potential for a nasty day, my anxiety increased. So with almost a certainty of no views, Molar Man and I signed the trailhead at 6:30 before taking our first steps toward the summit of Katahdin and the end of my thru hike of the Appalachian Trail. 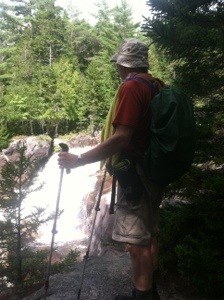 For about the first mile the agreeable trail only minimally elevated as it traversed over more roots, dirt, and small rocks up to Katahdin Stream Falls. From there the more severe climb began. 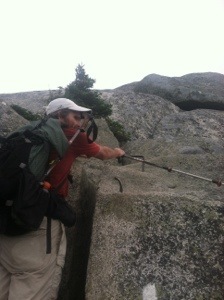 Like some of the climbs in the Whites, portions of trail required us to use our hands. When possible I chose to take advantage of the erosion areas to navigate around more challenging rock slabs. Eventually, however, rock scrambling was necessitated. 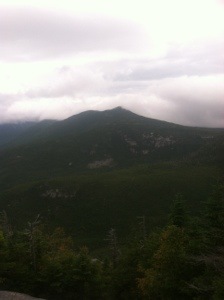 As the wind speed increased and the cloud cover expanded, we hit the most severe section of the ascent. For about a mile the climb became dangerous and unnerving, especially considering that a light rain had begun and the temperature was dropping steadily. As Molar Man and I neared the final few hundred feet of the 2000 foot ascent to the Tableland, he stopped, stooping down behind a boulder to shield himself from the sideways rain and wind. Surprisingly he asked, “Do you want to turn around here?” When I asked, “Why?,” Molar Man stated, “It’s not going to get any better.” For a brief moment I wondered if we were in danger due to the elements. If we turned around I would either have to try to summit another day or end my hike without seeing the summit. Neither choice appealed to me. “Let’s keep going,” I replied. When we returned to our full posture the wind almost knocked us over. So with Molar Man leading the way we continued the climb. While pulling ourselves up onto and over large rocks, we sporadically caught glimpses of cloud encircled pieces of surrounding ledges. In a way I think not seeing all the exposed areas may have been advantageous. A part of me was disappointed that we were almost entirely engulfed in clouds. Another sighed relief that the precipitous ledges remained invisible. We just followed the white blazed boulders up the mountain. By the time we got to the Tableland the winds made it almost impossible to remain erect. I kept Molar Man in sight as I hunched over to keep from being blown off of the mountain. That last mile past Thoreau Spring proved “foggy” in more ways than one. I had limited visibility and my mind was clouded with interspersed thoughts of finishing the trail and hypothermia. So many thoughts were running through my mind that the summit actually came upon me before I expected it. 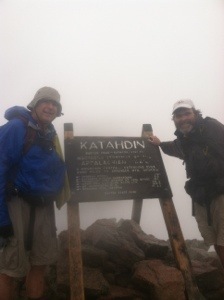 Due to the adverse conditions I could not see the summit sign until I was practically on top of it. The entire hike I have expected to get emotional at the summit. I didn’t. I simply wanted to get my picture taken and get off that mountain. Thankfully, there was one other hiker there. 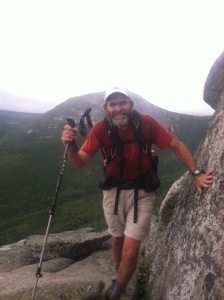 Ben, who said he had hiked up on another trail, took shots for Molar Man and me. It was exactly 10:00 at the summit. Because of the deteriorating weather we did not linger. In less than five minutes we began the descent. About a half mile down we met three other hikers that we did not recognize. Later we met a young man and lady. That was it. 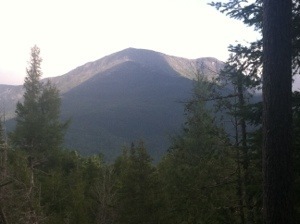 Katahdin was a lonely place on this bleak day. We needed to hike safely, but we also needed to hike quickly to get back below treeline. Twice on the Tableland the wind literally knocked me over. I walked in a crouched position to maintain my equilibrium. It was beyond challenging to navigate the steep ledges, now wet, in what had to be 70 to 80 MPH winds. Rain pelted us from above and wind blew us from behind. Through it all my hiking buddy and I just kept moving, knowing that we had to get down that mountain. Getting past the Tableland, Molar Man paused briefly behind a boulder. He was shivering. We were both drenched and cold. There was no way to eat our lunch, so we didn’t even try. We just kept moving, sliding down, easing down, painstakingly inching our way down the wet boulders. My gloves helped on the rebar even though they were also soaked. I just kept reminding myself of all those who were praying for me and a calming sense remained with me through the storm. Time passed rapidly, or did it stand still, as we just continued to make our way down the wet boulders. Finally we got back to treeline and then below. The terrain still demanded our attention; however, wind became less of an issue. Because of the steady cold rain and wet rocks, I had to be careful not to slip. 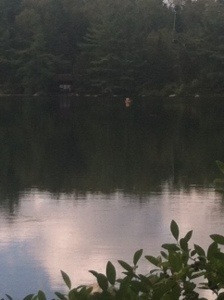 Molar Man and I stayed together as we moved closer and closer to Katahdin Stream and only one mile to go. When we did reach the level section of trail standing water covered large segments. Since our feet were already soaked, we just sloshed through the puddles. With each step I felt a sense of relief, knowing that we were so near to warmth and safety. 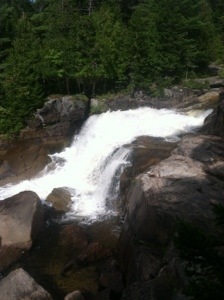 Then what we were about as anxious to see as the sign on Katahdin appeared. We stood before the trailhead register where we had stood seven and one-half hours earlier. Molar Man’s glasses were so fogged over that he could not see to sign out. I signed 2:00 for both of us. We had safely made it to the summit and back down. 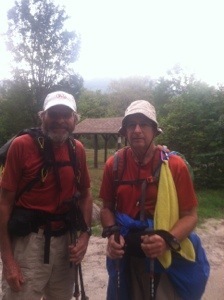 I could finally feel good about having thru hiked the Appalachian Trail. Within minutes Molar Man and I were inside the Volvo, getting warm and headed back to Millinocket. We met my family on the way out of the park. I had gotten off the mountain so quickly that their arrival was late. It didn’t matter. When I saw Linda, Lisa, Brent, and Lori, all was well. After a hot shower we all dined at the AT Cafe before my family and I drove to Bangor. Later in the evening Rachel arrived which made the end of the day even more special. So surrounded by those I love I said a prayer of thanksgiving for all that had happened during my five months and ten days on the Appalachian Trail. 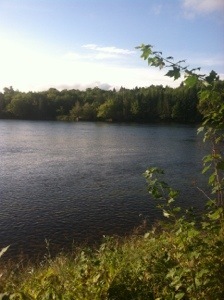 I’m sitting in the lobby of the Katahdin Inn in Millinocket, Maine, pondering. For a little over five months every one of my days has revolved around a hike. After tomorrow, hopefully, that will change. 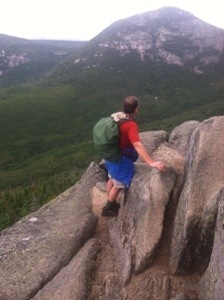 So with only the 5.1 miles to the summit of Katahdin remaining, I’m reflecting a little over my time on the AT. For a while there I didn’t think this day would ever arrive. Now that it’s here, it feels more like a dream in many respects than reality. To be quite honest, I just want to get it done and go home to Georgia. While I have been hiking the AT many have commented on trailjournals or on my website referencing the word “dream.” Thru hiking the Appalachian Trail has never really been a dream of mine. It’s something I’ve thought about at times; however, I’ve always come back to my senses rather quickly when I examined the enormity of the task. There is no doubt that if my brother had not died, I wouldn’t be sitting in Maine the day before a planned summit of Katahdin. If Don were alive I would be Don’s brother. I would never have become Don’s Brother. It was only his illness and death that prompted this adventure. 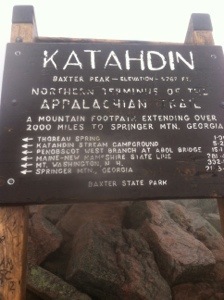 Prior to March 23 I had not done any section hiking of the AT since 2009. On that last trip I stopped after about 25 miles of a scheduled 160 mile stretch with a sore back and no enthusiasm. I went home with a total of a little over 1000 miles of section hiking, vowing to never hike the trail again. I really didn’t like hiking that much. So as I sit here on the eve of a completed thru hike (provided I can get through the toughest day of the entire hike), I want to make one thing clear. I did this hike because I told my brother I was going to do it. Today Molar Man agreed to start a little later with only 10 miles from north of the Abol Bridge to the Katahdin Stream Campground. When we did hit the trail at 7:30 we had an easy road walk for about a mile before the AT crossed Katahdin Stream and headed back into the woods. Other than the usual rocks, roots, and mud, nothing differed. 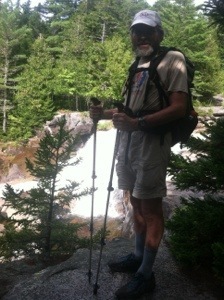 The trail did remain relatively level until we reached the lower fork of the Nesowadnehunk Stream. After the recent rains, fording looked too treacherous, so Molar Man and I opted for the “high water level” trail around the lower and upper forks of the stream. I think my buddy would have attempted a difficult ford had I not urged him to follow the safer route. A little later we walked up a side trail to Big Niagara Falls, a pretty impressive cataract I must admit. After a short break we followed the same path back to the white blazes for an extremely agreeable walk the rest of the way. At the Daicey Pond Trail parking area, some couples and their small children were headed up the trail toward the falls. From there we crossed Perimeter Rd. before the AT followed another short road to where it turns back into the woods. That, however, will be where we begin tomorrow. Before leaving Baxter we visited the ranger station to fill out our paperwork for tomorrow’s summit. The ranger also gave Molar Man and me a form to fill out and mail to the ATC headquarters in Harper’s Ferry documenting our completed hikes. We next drove back to Millinocket, had lunch, and returned to the motel where we saw Goose and All the Way, who finished yesterday. I got a much needed nap and am about to go out for supper. Then tomorrow I will be confronted with the most challenging day thus far, as I try to wrap up my thru hike on the Appalachian Trail.